The XTENDEX® Low-Cost HDMI Extender transmits digital video and audio signals up to 150 feet (46 meters) using one CAT5e/6 cable. Each video extender consists of a local unit that connects to an HDMI source and a remote unit that connects to an HDMI display. 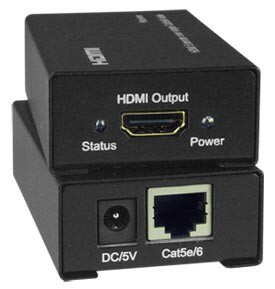 Transmits an HDMI signal over a single CAT5e/6 cable. HDMI 1.3 and HDCP 1.1 compliant. Supports lossless compressed digital audio: Dolby TrueHD and DTS-HD Master Audio. Compatible with a computer HDTV video source with HDMI output. One female RJ45 port for sending/receiving high definition video/audio signals. Recommended for use with 1080p HDMI displays. Note: if the input source is 3D the output display must support 3D. Not recommended for use with DVI monitors. Auto equalization for different lengths of CAT5e/6 cable. 150 feet (46 meters) over CAT5e/6 cable. Use CAT5e/6 solid straight through cable for TIA/EIA-568B wiring terminated with standard RJ45 connectors (not included). How to extend an HDMI display up to 150 feet away from the source.